A two-minute siren will sound across Israel on Monday morning in memory of 22,867 fallen soldiers and terror attack victims. According to the Defense Ministry's commemoration unit, 183 Israelis were killed in the line of duty or in terror attacks since last year's Remembrance Day. By Friday afternoon, the unit will have completed its logistic preparations for Remembrance Day, which include addressing the needs of bereaved families and a millions and a half citizens expected to visit military cemeteries across the country. According to the unit's figures, Israel's number of bereaved families is growing and now includes 4,999 widows. The number of single bereaved parents has reached 4,315, and there are 3,252 couples of bereaved parents. The number of orphans up to the age of 30 is 2,543. 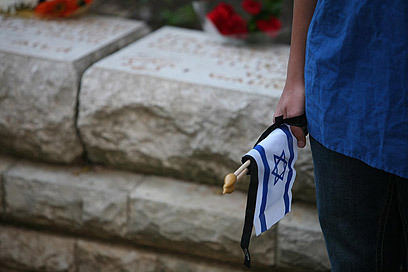 There are three different national customs on Remembrance Day: Lighting a memorial candle symbolizing the connection to Judaism, placing a bundle of flowers as an emotional expressing and paying respect to the fallen by placing a small flag of Israel with a black "In Memoriam" ribbon on each grave. Members of the Unit for the Commemoration of the Soldier will arrive at each of the 22,867 graves before the 11 am siren, light a memorial candle and place the flowers and the flag with the black ribbon. The unit's activity deploys across 44 military cemeteries across the country. It includes the renovation, maintenance, cleaning and gardening of the cemeteries, polishing and replacing defective or old tombstones. Israel counts its fallen soldiers and victims of terrorism since 1860, when the construction of Jewish neighborhoods began outside the walls of Jerusalem's Old City. Remembrance Day will commence at 8 pm Sunday with a one-minute siren which will sound across the country. The main state ceremony will be held at the Western Wall Plaza in Jerusalem in the presence of Israel's president, IDF chief of staff and Armored Corps commander. State ceremonies will also be held after Monday's 11 am siren at Jerusalem's Mount Herzl in the presence of the president and prime minister, and in 43 other military cemeteries across the country and near the memorial for fallen Bedouin soldiers at Hamovil Junction in northern Israel. See all talkbacks "Israel to honor its 22,867 fallen Monday"